Kurdistan Votes to Leave Iraq: What Happens Next? This article is part of our Referendum 2017 coverage, spotlighting controversial independence votes in two of the world's autonomous regions: Kurdistan voted yesterday on independence from Iraq, and Catalonia will vote this Sunday on leaving Spain. Kurdistan and disputed territories. Click for full-size map. Will Kurdistan become independent now? The Kurdistan region's government considers this vote official and "binding", in contrast to an informal 2005 referendum, even though the Iraqi federal government in Baghdad considers it completely illegal. But it was never intended to trigger an automatic declaration of independence. Instead, Kurdistan leader Masoud Barzani has promised to use a "YES" vote as leverage to negotiate independence with Iraqi government. So far, no date has been set for Kurdistan's declaration of independence, and it could still be years away. What if Iraq never agrees to let Kurdistan be independent? When asked in an interview this June, Barzani said "It's too early to say that". But he did rule out violent means, or any end to cooperation in fighting the so-called "Islamic State" (IS; formerly ISIS/ISIL). If Kurdistan's government eventually feels it's reached the end of the road in negotiations with the Baghdad, it could choose to declare independence unilaterally - that is, without anyone else's approval. But the international community rarely rewards that kind of independence declaration, and at best Kurdistan would become the next Kosovo, recognized by half the world but rejected by the other, and blocked from membership in major organizations like the UN. Which countries would recognize Kurdistan's independence? 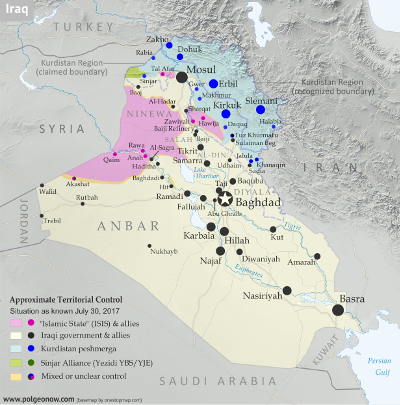 If Kurdistan successfully reaches an agreement with Baghdad before declaring independence, like South Sudan did in 2011, it will probably be recognized by almost all the world's countries. But if it declares independence unilaterally, its prospects aren't so good. 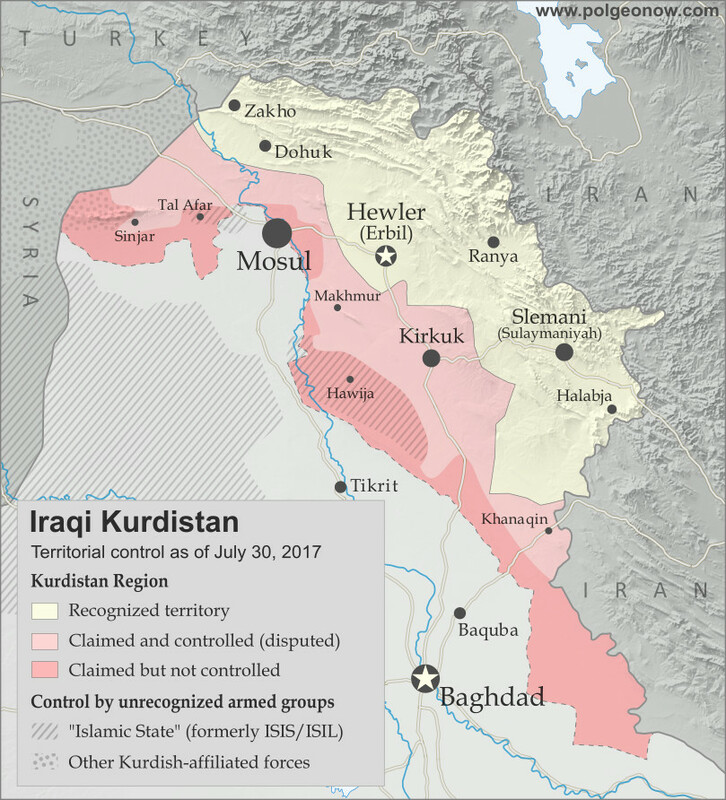 The Iraqi government and neighboring countries Iran, Turkey, and Syria all strongly opposed Kurdistan even having this referendum, and would be even more livid at an outright declaration of independence. Major world powers have been more lukewarm: The US and Germany opposed the timing of the referendum, but might be sympathetic to eventual independence, while Russia and France have declined to take sides at all. There is one country that gave its full support to the referendum, and would be most likely to recognize an independent Kurdistan: Israel. As a country that also sees itself as the best hope for protecting a persecuted ethnic group, Israel has a lot in common with Kurdistan. Because of that, Israeli leaders would be happy to have an ally in the region who's not friendly with Iran and doesn't share brotherly relations with the Arab Middle Eastern countries (Kurdistan's people are mostly Muslim, but not Arab). But isn't Kurdistan a great candidate for independence? Iraqi Kurdistan is often held up as an example of an aspiring country that would actually be more stable and democratic than the existing countries in the Middle East. And that may be true: Iraqi Kurdistan has been a lot more stable lately than Iraq, Syria, or Yemen, and it's probably more democratic than most of the countries surrounding it. But it's not that simple: the Kurdistan Regional Government has its fair share of problems too, dominated by one political party built around a family dynasty, led by a president whose term expired two years ago, and often accused of corruption. Meanwhile, many outside observers worry that Kurdish independence would destabilize the region, leading to violence as neighboring countries oppose the change and Kurdish minorities in those countries become emboldened. On the other hand, many feel that the Kurds, long persecuted by other countries' governments, deserve a country of their own regardless of the risks. And scary predictions about the future often don't come to pass. PolGeoNow neither supports nor opposes Kurdistan's independence. As always, we're just here to report what happens. Still, the people of Kurdistan really do want independence, right? Though 92% is surprisingly high (a poll last month found 25% planning to vote "NO"), it seems that most Kurds in Iraq do want an independent country. Although the second-largest party in Kurdistan's parliament opposed the timing of the referendum, it supports independence in principle and decided not to the boycott the vote. Of course, not everyone in Kurdistan is a Kurd. The region is also home to many Turkmen, Arab, and Assyrian people (these are language-based cultural groupings; in terms of religion, Kurds, Arabs, and Turkmens are all mostly Sunni Muslims, with some Shiites and local minority religious groups, while Assyrians are mostly Christians). Many Arabs, who form the majority in Iraq as a whole, opposed the vote, especially in disputed territories like Kirkuk. But others supported it, having more faith in the Kurdistan government than Iraq's. Turkmens and Assyrians were similarly split, with minority political parties representing them coming down on both sides of the debate. Stay tuned to PolGeoNow and the PolGeoNow Twitter feed for more updates on Kurdistan, plus Catalonia's upcoming referendum on independence from Spain! Click here to view all Referendum 2017 articles. 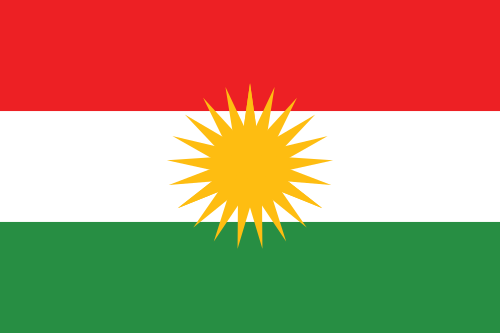 Graphic of the Kurdistan flag is in the public domain (source).